Home » Baseball Basics » What's Wrong with Jose Reyes? If it were still April, the “shaking off the rust” excuse would still apply to Jose Reyes. However, we’re now getting into mid-May, and Reyes is floundering with a .229 batting average and a .281 OBP. Those certainly are not the numbers you’d expect from the best offensive player on your team — a.k.a. the number-three hitter. Could this batting third thing be getting into his head? It seems to me that his plate discipline has gone out the window since moving to the #3 spot — but that’s just my old eyes and my unreliable memory talking. So, as much as I tend to eschew “the new math” of baseball, I took a suggestion (via Twitter) from Craig Glaser of Sabometrics and took a look at “swing rates” on Fangraphs. Accordng to the numbers, Reyes’ “outside swing percentage” (or “O-swing%”) — the percentage of balls outside the strike zone that he’s swung at — is over 35%, which is a significant jump over his career rate of 25%. So maybe my eyes and memory aren’t so bad after all. There are two problems with this number. First, is the obvious — it’s a small sample size, and those can’t ever be trusted to explain anything. Second, this 35% number covers the entire year, and it appears he’s been at this rate while hitting both third and first. However, I would argue that the rate was unnaturally higher from the beginning — when he was hitting leadoff in his first 11 games — because he was both rusty and incredibly anxious after missing almost an entire year of competition. Reyes — like most ballplayers — is a human being and therefore can be affected by internal pressures, motivations, and other things going on between the ears. I wouldn’t be surprised to see Reyes’ discipline level down back to his career 25% over the last month if he were hitting leadoff — where he is expected to take walks. You can say all you want about batting position being meaningless, but some individuals change their approach based on their place in the order. Reyes could be one of those guys. (Just like Mike Jacobs might be one of those players who can’t handle batting cleanup.) When Willie Randolph became manager, one of his “pet projects” was to get Reyes to understand the idea of OBP and its importance in the leadoff spot. 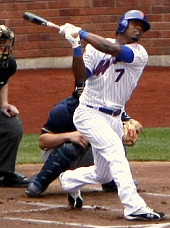 As a result, Reyes nearly doubled his walk total from 27 in 2005 to 53 in 2006, then jumped to a career high 77 in 2007. So it could be argued that Reyes changed his approach to be a more valuable leadoff hitter. It could also be argued that he simply learned not to swing at bad pitches as a result of experience. You make the call. This year, hitting in the third spot in 17 of his 28 games, he’s walked a grand total of 9 times — which projects to about 45 over a full season. As mentioned above, 35% of the pitches he’s hacked at have been outside the strike zone. The rust should be gone by now, and it’s fair to at least consider the idea that Reyes’ wild, undisciplined, impatient, and overly aggressive approach has something to do with his mindset regarding the responsibility of the #3 spot in the order. Maybe he’s swinging more because as the third hitter he feels a need to drive in more runners, and/or hit the ball further and more often. Maybe not being a leadoff hitter is a cue to him to not watch too many pitches pass by. It’s all conjecture, of course. For all we know, Reyes has the exact same thoughts in his head that he had from 2006-2009, when he was swinging at pitches outside the zone 10% less often. In other words, this is a slump that knows no batting position. Perhaps, after hitting in the 3-hole over another 50-60+ games, that “O-swing%” will trend back down toward 25% — and this argument rendered moot. Joe, I can’t argue against his approach, or the results, but I will argue that his position in the order should not matter. First look at his career numbers. At his best he is a great hitter: high OBP, above the mean BA hitter who should push .300, and the third best SLG of any Mets regular still with the team from the past 3 years. So, at his best, batting third should produce good results overall if he did not change his approach and the numbers lined up with his career marks. He would have many more RBI and probably less steals, but I’d take the RBI over the steals any day. But I don’t think this is the issue here. I want to say Reyes is fine batting third because the numbers say if he puts out the same production batting third is a good idea… but my eyes tell me he just doesn’t have it right now. I am not a guy who likes the idea of the same lineup day-in, day-out when guys are struggling. Within reason I would move guys around to put my hot hitters in the middle of the action and my struggling guys in positions to focus on getting out of their funk so I could put them back to where they belong. So if I believed moving Reyes back to leadoff would get him back together, then I’d do it. The problem is I’m not so sure this will work. I just think he is doing what he always does when he is struggling, losing patience and getting under the ball. This tended to happen when he tried to hit for power. There I believe is the problem. He should not change his approach, but he has, trying to hit for power. He needs to hit line drives all over the field and let the power just come naturally. If that happens form the leadoff spot, great, but I’ve seen him do this before batting leadoff so I’m not convinced hitting him there will work. Anyone who thinks he will immediately go 3-4 with a triple and a walk and two steals the moment he is returned to leadoff are crazy. He just needs to remember who he is, and that might be hitting leadoff, but I wish that did not matter and he could just hit the way he always has no matter where he hits in the lineup. I think Reyes is screwed no matter where he hits in the lineup – at least in the interim. Why? Because the Mets absolutely needed to rush him back to the team after he essentially had zero spring training preparation and zero exhibition and rehabilitation games to tune up. This after missing the final 4 months of 2009 and being all but completely shut down in March for 3 weeks due to his overactive thyroid condition. Aside from a handful of extended spring training games, in which he didn’t play the field or remain in for longer than 5 innings for half of, and 1 game at St Lucie, Reyes had no time to get himself back into “playing shape” since being shelved with various ailments since last May 20th. What you get is a player who is constantly trying to feel his way back while facing off against high-level competition in high-pressure situations. Is it really any surprise Reyes has struggled as much as he has looking back at his past 9 months and knowing how little time he had to get back up to speed with the style and tempo of the major league action? It would be like not driving a car for 9 months, and then being told to participate in the IndyCar series after your only preparation was pulling out of your driveway. It would be like not talking for 9 months, and then being told to recite the “Peter picked a peck of peppers” tongue twister three times fast after your only preparation was clearing your throat. It would be like anybody not doing something for a long period of time only to try to do that something again at the highest level with only very little preparation. You get the message. I don’t think the solution is sending Reyes to the minors for conditioning until he finds his way back into form. I also don’t know if moving him back to the leadoff spot, or batting him 2nd, or 8th, would have an effect. I don’t think I have a solution. I just know the Mets are the ones who screwed Reyes up by light-speeding back to the big leagues when an extra week or two in the minors could have avoided this whole dilemma. I was pondering just this very thing last night Joe. To me, something about Reyes’ swing looks different than last year. He rolls that front foot up on its toe as a timing device and he loads up his hips, almost turning them away from the pitcher before firing through and swinging. To me this whole first part looks like it is happening earlier than in years past– like he’s being very conscious about trying to let the ball get deep before swinging, but he’s not delaying that little counter-turn of the hips so he’s got to try to hold it before swinging. More herky-jerky than in the past to my eyes…. Joe, thanks, sincerely, for trusting your eyes first and then backing it up with numbers. The trend today is to create numbers and frame them as truths. BUCK – THAT. What was the catalyst to Jose’s breakout yr? Have you forgotten? As I recall one of the FIRST things Omar did in that Spring trng was bring in Ricky to work directly with Reyes. Ricky the most confidant man in baseball (again) embued his persona on the Mets and Reyes….Yes, i think an extra 2 weeks in Fla would have helped..more so if Ricky was there. But bottomline is Reyes’ game is about confidence, and he needs some back. Heck I think the Post-Rickey era (the last 2 yrs are admissable as evidence). No I dont think ricky needs to come back (as base running/hitting coach)…but I dont think his dugout/Spring trng presence is missed. All of this is a moot point when Jose continues to make boneheaded fundamental mistakes. Yesterday he hit the trifecta. First, Reyes committed an error in the 5th inning on an easy grounder, which led to a bases loaded, 1 out situation. Fortunately, Pelfrey was able to escape but it ran up his pitch count. Second, Jose was thrown out at third base while attempting to advance on a grounder hit in front of him when there was no force. Had he stayed at second, he would have scored the eventual go ahead and winning run. This is the third or fourth time I’ve witnessed Reyes make this dumb base running gaffe. And third, in the 7th inning, Reyes failed to get a sac bunt down to advance the go ahead or winning run. Instead, he fouled off two pitches –neither being strikes, and then promptly grounded into a 4-6-3 double play. The next batter, Jason Bay, then singled to left. None of these plays show up in the boxscore. But had Jose executed either of the final two basic fundies, the game would have been over in 9 innings and the Mets would have walked away with a “W”.